German rabbi; born 1810 at Hürben, Bavaria; died at Frankfort-on-the-Main Dec. 8, 1888. As teacher and preacher at Heddernheim, near Frankfort (1833-38), and at Wiesbaden (1838-45), and as rabbi at Langenschwalbach and at Ems, he exercised a great influence upon Jewish affairs in the duchy of Nassau. It was chiefly at his suggestion that by the new regulations of the Jewish cult (Feb. 3, 1843) four district rabbinates were organized; in 1860, when Treuenfels of Weilburg was elected rabbi of Stettin, these were reduced to three. In 1846 Hochstädter established a teachers' seminary, which by order of the government received an annual subsidy from the general Jewish fund. At Wiesbaden Hochstädter had already prepared some young men for the teacher's vocation, among whom was Seligman Baer of Biebrich. In 1851 Ems became the seat of his rabbinate and of the seminary. The latter existed until 1866, when Nassau was annexed to Prussia. Hochstädter remained at his post until 1883, when he retired to Frankfort. He took an active part in the Jewish synods of Leipsic and Augsburg. Hochstädter wrote scientific articles for Geiger's "Wiss. Zeit. Jüd. Theol." and other periodicals. Besides some sermons, he published: "Ḳol Omer Ḳera," a Hebrew phonetic primer, Wiesbaden, 1839; "Die Glaubens-und Pflichtenlehre des Judenthums," Ems, 1862; "Sefer ha-Meforash, Religionsphilosophische Erläuterungen zur Glaubens- und Pflichtenlehre," ib. 1864; "Biblische und Talmudische Erzählungen für die Israelitische Schuljugend," ib. 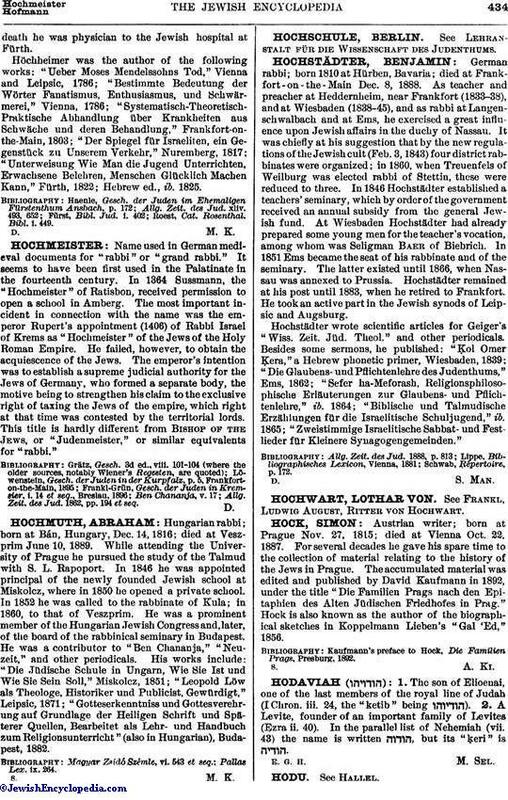 1865; "Zweistimmige Israelitische Sabbat-und Festlieder für Kleinere Synagogengemeinden."